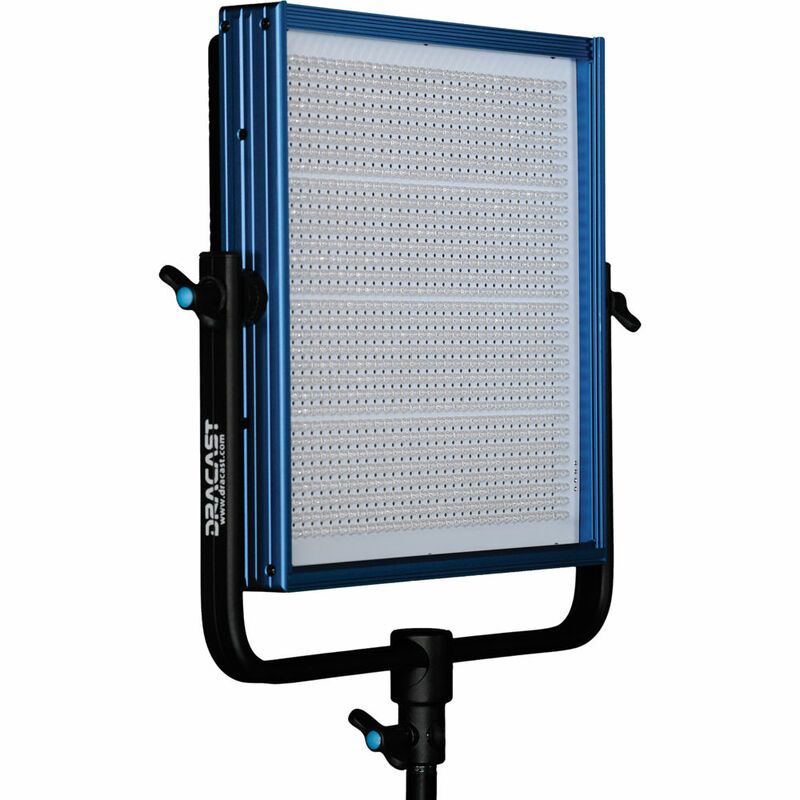 At 5.5 lb the LED1000 Pro Daylight LED Light with Gold Mount Battery Plate from Dracast is an ideal choice for the studio or location work where color accuracy, control and flicker-free output are of major importance. The LED1000's daylight balanced output is well suited to outdoor work or for color matching HMI fixtures, while its high CRI of 95 renders colors with precision and fidelity. Dimming from 100-0% is conveniently done with a back-panel knob that adjusts the output with negligible color shift. The low electrical draw of just 60W means a timely return on your investment. The durable anodized aluminum frame is supported by an sturdy, U-shaped yoke with locking knobs on each side and a standard 5/8" receiver. This LED1000 can be used worldwide thanks to its included 100-240 VAC power adapter. You can also use the onboard Gold mount battery plate with 14.8V batteries when mains power is unavailable. Accessories include optional 4-way barndoors for contouring and control of the LED1000's 45-degree beam angle. A carrying case is included. Box Dimensions (LxWxH) 18.1 x 17.7 x 8.2"
LED1000 Pro Daylight LED Light with Gold Mount Battery Plate is rated 5.0 out of 5 by 17. Rated 5 out of 5 by mikab from High quality light Starting out as a documentary videographer I knew I needed a high quality light. After thoroughly researching my options I knew I had to go with the Dracast LED1000 Pro. I have used them exclusively on two films thus far and I am amazed at the quality of lighting. Dracast offers a natural even color with no green or magenta spike, as I have experienced while using other cheap light kits. I have yet to see any dip in color or flickering - this makes the editors very happy. Portability is ideal, and with the lightweight LED panel I can pack it quickly with the rest of the equipment without scorching myself. These lights are amazing. Rated 5 out of 5 by ParTen Video from Great quality light I am starting out my videography business and needed lights to use when I do interviews. These lights are exactly what I was needing. They are portable, light weight and come with a nice carrying case making it easy to take them to on location shoots. They put off a lot of light and do not get hot which makes it quick to take down after an interview without worrying about getting burned. This light even works with Anton Bauer compatible batteries. The light gives off a pure white light. I have used these lights for several hours at a time and the color temps remain more or less the same. I would recommend these lights to anyone wanting quality, natural lighting in their videos. Rated 5 out of 5 by MAVERICK Picture Company from Fantastic Product These lights are fantastic. I researched LED lights quite extensivly before this purchase. The high CRI output of Dracast produces a light your camera will love. They have a good punch in a soft source that your talent will love. I have been a freelance network cameraman for over 25 years. In that time I have seen and used alot of products. Dracast lights are built to take the wear and tear of the real world. Anytime I am on location and other cameramen ask me about these lights I highly recommend them. Dracast responded quickly and professionaly when I was researching their product. At the end of my questions they asked me for input on future products. They care not only about their product, they also care what the people using their product think. Rated 5 out of 5 by TJ from Worth Every Penny This thing is great for both indoor and outdoor filming, lightweight and compact so it's very easy to haul around, and doesn't get overly hot so you can put it away or move it without having to wait for it to cool down or burning yourself. It is plenty bright and looks very natural, which I am extremely happy with. All too often light looks artificial, which as we all know is never good on film. What I think I like best is that it can be either battery powered or plugged in, which makes for efficient production. Put simply this is the best piece of lighting equipment we have on our set. Rated 5 out of 5 by Dustin S. from As expected, Perfect! The color rendering index of the LED1000 is so perfect, therefore the color it produces is so close to the natural sunlight. The color accuracy is superb and the lights have a consistent color temperature. For any interview or filming, it's a great choice. The LED panel is exactly what I was looking for! It gives a lot of light while I need it. Even the panel remains cool. I can use it for a long time consistently. It also came with a carry case, so it's easy to carry. I just loved it, and will highly recommend this Dracast LED1000 Pro LED Light. Rated 5 out of 5 by manderson from Great LED to add to your arsenal. I bought this light for carrying in my bag for portrait photography in landscape situations. This light produces plenty of light to get rid of the awkward shadows produced by the suns single point light source. Makes your subject much clearer, which gives me happier clients and more repeat business. I love the portability of this light as well. 90% of the time, my photographs are taken outside. With this lights size, weight, temperature after being on for a while and it being super bright...I won't shoot without it again. Great product! Rated 5 out of 5 by Digitalmarketin from Great Quality The Dracast LED1000 Pro Daylight LED Light with Gold Mount Battery Plate is rapidly becoming a viable option for indoor and outdoor shooting due to its number of fantastic features. It comes with an essential portable battery-powered lighting fixture and the quality is a lot better than I expected when I first purchased it and it has saved me a ton of money over the long run. It is a great LED Light and I am certain that anyone that has purchased this product is satisfied and getting real value for money spent. Rated 5 out of 5 by Bubba from Great light! Bought a Dracast LED1000 2X daylight kit. I spent two months studying LED lighting before deciding on these lights. Best specs on output and lower cost that the big name lights. After using on five exterior live shots I can say that they were worth it. This time of year I can do a sunset live at five then put the CTO gels in the frame for the night shot at six. I haven't used the AC power supply yet. Running off AB bricks. Makes it very easy to move around! They are everything I was expecting!